(Sheetlet with 1 value (1v M/S): 10.00. 3) Select each item and 'Add to Basket'. (Israel 2017 Israeli Music - Love Songs - Mint Never Hinged (MNH). Sheetlet with 10 values (10v M/S): 2.40 x 10. 3) Select each item and 'Add to Basket'. Set of 1 value (1v Set): 10.00. You will be back for more! (Sheetlet with 15 values (15v M/S): 10.00 x 15. 3) Select each item and 'Add to Basket'. Set of 1 values (1v Set): 5.00. You will be back for more! Sheetlet with 1 value (1v M/S): 10.00. You will be back for more! 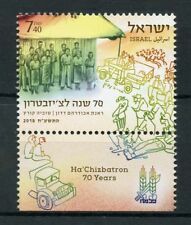 Israel 2018 Ha'Chizbatron - 70 Years - Mint Never Hinged (MNH). Set of 1 value (1v Set): 7.40. You will be back for more! 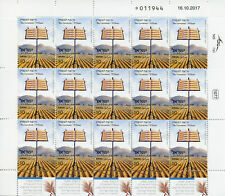 (Israel 2018 Ha'Chizbatron - 70 Years - Mint Never Hinged (MNH). Sheetlet with 15 values (15v M/S): 7.40 x 15. 3) Select each item and 'Add to Basket'. (Sheetlet with 10 values (10v M/S): 5 x 10. 3) Select each item and 'Add to Basket'. Set of 1 value (1v Set): 5. You will be back for more! Set of 1 value (1v Set): 7.40. You will be back for more! 30,00 EUR prix catalogue, selon Michel Nahost Nord 17. 40,00 EUR prix catalogue, selon Michel Naher Osten 13. 2,60 EUR prix catalogue, selon Michel Naher Osten 13. He was among the first conductors born and educated in the US to receive worldwide acclaim. chamber pieces and piano music, Bernstein was well-known for his. USA CAREER : Bernstein graduated from Harvard University's Music Program in 1939, and made his first appearance as the. Israël - 2014 - No 2238/2240 - Musique. Pour pouvoir en bénéficier, il est nécessaire d'utiliser la fonction "ajouter au panie r". For those who are not (used or new with hinges), the condition is indicated in the title. SELLOS MUSICA ISRAEL 1995 1273/74 ARNOLD SHOEMBERG /DARRIUS MILHAUD 2v. Arnold Shoemberg. Darius Milhaud. ISRAEL 1995. GASTOS DE ENVIO. SERIE COMPLETA. Agrupamos ENVIOS PARA DISMINUIR COSTES. Israel 1997, SC 1315-1317 with tabs, MNH VF. Music and Dance in Israel. Wolfgang Amadeus Mozart, death bicent. Israel 1991, SC 1101 with tab, MNH VF. Israel 2000, SC 1408 with tab, MNH VF. Johann Sebastian Bach, composer. SELLOS MUSICA ISRAEL 1996 1328 FELIX MENDELSSOHN 1v. ISRAEL 1996. GASTOS DE ENVIO. SERIE COMPLETA. SELLOS MUSICA ISRAEL 1996 1310 GUSTAV MAHLER 1v. Gustav Mahler. ISRAEL 1996. GASTOS DE ENVIO. SERIE COMPLETA. Jewish Composers. Ernest Bloch, Leonard Bernstein. Israel 1995, SC 1225-1226 with tabs, MNH VF. GOOD LUCK! Archaeological and written data have demonstrated clearly that music was an integral part of daily life in ancient Israel/Palestine. Jewish Composers. Israel 1996, SC 1274-1275 with tabs, MNH VF. GOOD LUCK! FINE & FRESH UNMOUNTED MINT SINGLE TAB STAMP - ISRAEL ISSUE 2013. BASED ON ONE OF THE ITALIAN'S MOST FAMOUS OPERAS - "NABUCCO". KINDLY NOTE. SELLOS MUSICA ISRAEL 1995 1269/70 ERNEST BLOCH / LEONARD BERNSTEN 2v. Leonard Bernsten. Ernest Bloch. ISRAEL 1995. GASTOS DE ENVIO. SERIE COMPLETA. Agrupamos ENVIOS PARA DISMINUIR COSTES. 2007 - "DANCE !". - BALLET, ETHNIC, FOLK, & MODERN DANCE STYLES. WE ARE ALSO. There is NOTHING more that can be added to the life and music of WOLFGANG AMADEUS MOZART (1756 - 1791) that cannot be found on "Google" or in "Wikipedia". 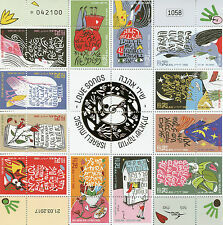 This is Israel's stamp of appreciation for the pianist and composer, issued in 1991. Lure, Cymbals, Double oboe. Israel 1956, SC 121-123 with tabs, MNH VF. ERNEST BLOCH (1880-1959). The secondary image in the design is a scene from Bloch's opera "Schelomo", about the legendary King Solomon. Date of issue: 7 Feb. 1995. Israel: Sc#1225; Bale 1173; S.G. 1267. Et n'oubliez pas de m'ajouter à votre liste de favoris ! Magnifique série complète de timbres neufs en parfait état.